When I went to visit my Mom I got her to teach me how to use a pattern for clothes. I wanted to learn how to since I never had and wanted to make Erin a shirt for her birthday and the girls clothes. So with my mom next to me and guiding me I made this skirt for me using elastic thread in my bobbin! It does the awesomest thing.....Shirring. Love the gathered look. One of the easiest things I have ever made. I knew I wanted to make the girls dresses with the shirring since they are my favorite dresses for the summer and they do look easy to make. I brought my prized Katie Jump Rope fabric to make them out of. It just took some adjusting on the sewing machine to get it to like the elastic thread in the bobbin, but once we figured that out it was so easy. 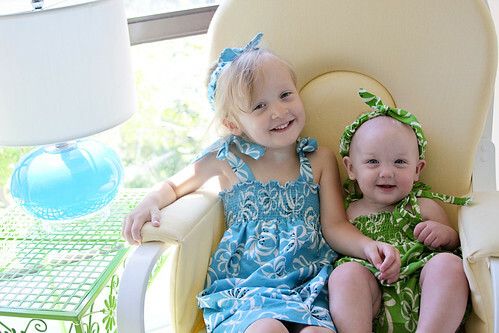 I am going to make these dresses all the time now for my girls and for gifts. Here are my girls in them. My Mom made the elastic headbands for them to match. The straps are just two long pieces of fabric that we tied into bows. So simple. 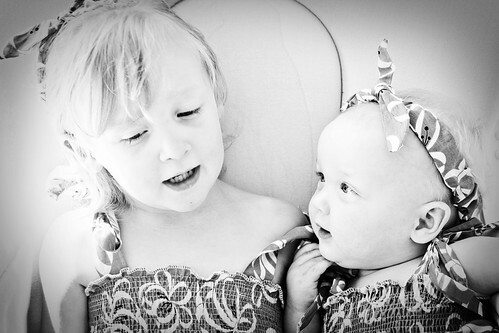 I just love me some matching dresses for sisters! Now I can make them anytime. 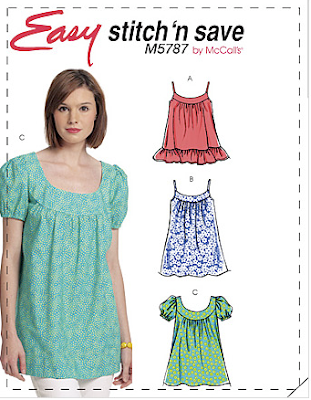 I made Erin a shirt using McCall's pattern # M5787. I did # B the tank top with out the ruffle since Erin is not a ruffle girl. I realized I forgot to take a picture of it. 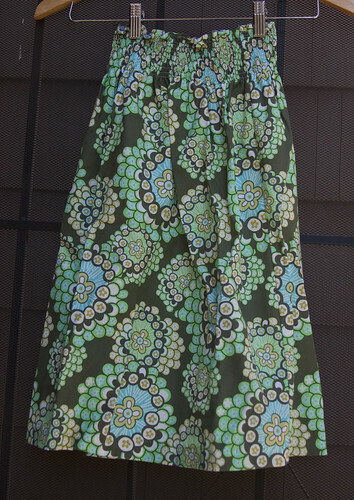 I also used Katie Jump Rope in the Green Bandana fabric since it is one of Erin's all time favorites. You can kind of see the shirt in my hand in this picture of my Mom & I. Thanks Mom so much for showing me how to make these clothes! Now I feel good enough to do it all on my own. hello there!! i was on the hunt for some fresh new blogs to read and happened upon yours. :) like a breath of fresh air. 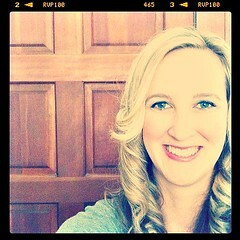 :) i'm off to peek around. :) Happy day to you! All the clothes are so cute! I really really want to try this shirring with elastic thread, but am so afraid it won't work for me! You've given me inspiration to try it! I have read about using elastic thread to do this but I am not really sure how. I have read "how to" articles but I am so afraid of screwing up. Where do you get the elastic from? Does it come on a spool? I have found some but I would have to wind it on the bobbin by hand....not only that but it seems too thick. Okay, one more question....does it crinkle on it's own or do you have to pull the edge strings? yes you have to wind the elastic thread on the bobbin yourself. Just pull tightly as you wind it on. As you sew it on it crinkles the fabric yourself. What what I was doing I did about 10-15 rows with the girls dresses and each time I started a new row I had to make sure the fabric was pulled straight so when I sewed the next row the fabric laid flat and was not gathered as I sewed the next row. If it is not gathering as you sew then your tension is not correct on your machine. Let me know if that all makes since! Hello! I stumbled upon your blog from your post on Made's Flikr group. I love it! I was wondering how you made the cute matching head bands? I love the shirring! I've been seeing it around a lot lately. Now I think I need to make myself a comfy postpartum skirt! Your girls are adorable!